Unmatched as an offering to the Gods & Goddesses, this plant has an interesting Legend behind it. For Hindus certain leaves and flowers have religious significance. The Tulsi leaf is considered important and most sacred among them, especially by Vaishnavites. 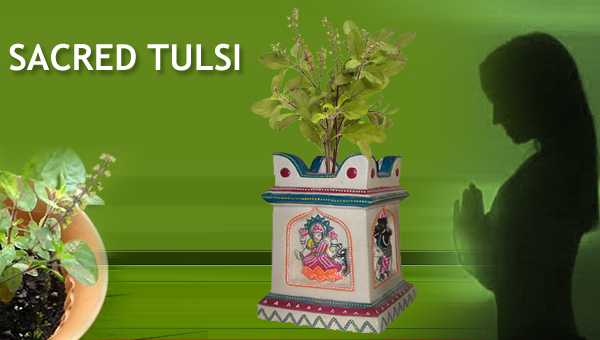 Tulsi is an important component of Vishnu Pooja in temples as well as at home. Tulsi Tirath (water in which Tulsi leaves are soaked) is the Prasad given in Vaishavite Temples. Ekadasi Upvasa (fasting) is broken the next day, on Dvadasi by sipping Tulsi Tirath. The Hindus cling to Tulsi even in the last moments of their lives. Ganga water, further sanctified by the presence of Tulsi in it, is dropped into the mouth of a dying person in the belief that the soul would attain moksha by doing so. No wonder the Tulsi plant occupies a prominent place in countless households. Women perform daily pujas to the Tulsi Madam ( a rectangular shaped cement or brass structure in which the Tulsi plant is grown, seeking long married life, health, wealth and prosperity. It is a tradition in South India to keep th a Tulsi shaped salagram (a special spherical or oval shaped black stone with silver or gold like streaks on its surface) which is believed to symbolize Lord Vishnu. In temples also the salagram is worshipped with Tulsi leaves, in the belief that Tulsi and Salagram should always be together. Why is there so much importance given to Tulsi? The Vishnupurana, The Sivapurana,, The Mahatmyam and the Tulsi Ramayanam narrate an interesting and unusual mythological event, which throws light on the birth of the tulsi plant and salagram. There lived in the Satya Yuga an asura (demon), Jalandar. He performed deep penance for many years and slowly gained a lot of powers from Brahma and Siva. He was blessed with wealth equal to that of Lord Indra and strength matching that of Lord Siva. He ruled the three worlds as a tryant, enjoying all splendours of life and torturing the devas and rishis without any let up. When the ocean milk was churned by the devas and asuras, Sri Mahalaxmi made her appearance as a dazzling angel of prosperity. Struck by her wondrous beauty and charm everybody aspired for her. Jalandar was no exception. Goddessess Mahalaxmi chose to be the consort of Lord Vishnu. The disappointed Jalandar performed penance again, this time to seek a wife equaling maha- lakshmi in excellence. brahma granted her the boon and created an angel like woman who matched Mahalaxmi in all her features. She was named Brinda. Jalandar took her as his wife. Like all other asuras, Jalandar also aspired for immorality. He again performaned severe penance. When God appeared before him he sought that boon. How could anybody be blessed with such a boon? Everybody born has to die someday. Instead God gave him the option of laying conditions for his death, as in the case of Hiranyakaspu and some other demons. Jalandar had great confidence in the chasity of his wife, Brinda. Very proudly he demanded that he should live as long as his wife was utterly chaste and dutiful- pativrata. Innately she was also a devotee of Lord Vishnu since Brahma had created her with the features of Mahalaxmi. Meanwhile, Jalandar became more and more arrogant and powerful. He continued his atrocities and cruelty against the devas and rishis. Unable to put up any more with the torture by Jalandar the devas and rishis prayed to Vishnu and Siva for salvation. Siva promised that he would destroy Jalandar. When Jalandar heard that Siva has blessed the devas with his protection, he intensified his atrocities, confident that because of his boon there was no death or destruction for him.